"The Black Rai"n is the third album from the Tokyo-based modern-classical/post-rock ensemble, Anoice. Aside from Anoice, this music group is made up of many other wonderful projects: the solo work of Takahiro Kido and Yuki Murata (who are both members of Anoice), RiLF (The alternative-rock band formed by the members of Anoice and Calu, who is the vocalist of Matryoshka), films (The Tokyo-based dark classical music unit, featuring members of Anoice and two females' vocals in their original languages), mizu amane (Films' side project featuring Japanese languages), mokyow (The instrumental-rock band formed by Takahiro Kido and Tadashi Yoshikawa, and the keyboardist Kenichi Kai) and cru (The modern-classical music unit formed by Takahiro Kido and Yuki Murata), and some secret projects. Be immersed by the grand orchestration of piano and strings that often manifest a destructive beauty with the addition of vivid noise and rhythms. Recorded in Tokyo and London, this album contains excellent tunes such as "colder than thermite", which served as background music for the Louis Vuitton iPad application. "Ripple", was made for "Variations of Silence", a modern-classical music compilation album planned by Tower Records. And "drops" was made for "More Hope for Japan", a charity compilation album. In addition, four music videos are now available to view on YouTube: "ripple" directed by Patryk Seni Senwicki and Tamas Kiss in Austria, "white paper" made by Ukrainian art unit SYN and Anoice member Takahiro Kido, and the videos for "finale" and "drops" were created by the members of Anoice themselves. The Black Rain was released on year after the Great East Japan Earthquake, may the victims of the disaster find peace. Yoko Shinto’s cover illustration is incredibly beguiling: simultaneously dark and light, mysterious and accessible, a treasure trove of associations. We see a weeping woman on a cliff, her tears mingling with the rain and the flood. The broken land in the foreground is balanced by stable architecture in the background: a tower, a steeple, a town. The blackness of night is countered by the glow of the full moon, miraculously visible despite the covering of clouds. Is this the black rain that fell after the bombings of Hiroshima and Nagasaki, the fallout from the 2011 reactor meltdown, a metaphor for the fears of an embattled nation? The video for “Finale” seems to imply the former, but while this suggests the title’s origin, it only hints at its current context. The Black Rain screams concept album, but invites listeners to decipher the concept. Like its cover, the album is darkness and light, despair and hope, enigma and interpretation: a possible reflection of a nation emerging from its largest victimization in over half a century. Bea’s operatic vocals, which appear in both the prologue and the finale, are a bit unhinged, stretching for consolation through lament and lifted prayer. She seems to be asking, “Why?”, not caring who hears or what response they might provide. The effect is unsettling, especially as radio transmissions and dark strings extend a very uncertain safety net. This is not the Anoice of love and laughter; this is an Anoice living in the shadow of destruction. The Black Rain withholds answers, preferring to dwell in the land of the buried in order to translate their voices. And yet there is great yearning in these sullen sounds: a violin that wishes to raise her head to heaven, a piano afraid to pause for fear the tears will erupt. ”Colder Than Thermite” exemplifies this approach, stalling to silence at the midway mark, giving way to distant, mournful organ. And then everything slows down, like a clock losing energy after its owner has died. Even “Ripples” ends before it’s over, as if lacking the strength to finish. A hint of circus melody is carried on the breeze, a phantasm of better times. The rain is made audible two tracks later: a combination of elements associated with life, twisted by radiation to its opposite. But “White Paper” intimates a blank slate, a future yet unwritten. The scroll is calling for a scribe, the ink for a brush. What characters will be written on this catastrophe, what lines will embrace its lineage? In the opening bars of “Drops”, a shift: the last tears, the last drops, the last ripples, the last advancing tide; and the trains begin to run again, and the marching band begins to march. The only drops now are from buckets and ceilings. The clouds have moved away. In the end – as portrayed by Shinto on the back cover – the weeping woman rises, head upright, as if to say, I no longer need to be protected from the things of this world. She has wept the world’s tears, bathed in black rain, and emerged scathed, yet intact: irrevocably altered, irrepressibly resolute, the mirror of a nation that can not, will not allow its character to be determined by destiny alone. Since their inception in 2004, Anoice have set a new standard for airy, modern classical compositions. Their debut album, “Remmings” made huge waves on it’s release in 2006, owing mostly to it’s compositional structure, and inherent grace. In stark contrast to the majority of modern classical works around at the time, it was very much based around typical ‘Pop’ structures and timbres. There was a lighter element to the pieces, and a hint of electronics was used to add something extra to the mix. “The Black Rain” retains the use of electronics, but the theme of the album is somewhat darker in comparison (following on from 2008’s “Out of Season” and “Ruined-Hotel Sessions”). The beautiful piano playing of Takahiro Kido (a solo artist in his own right, debuting in 2008, with his outstanding release “Fleursy Music”) is ever-present, but less emphasized. There are a lot more pieces that work wonderfully to build tension between the other pieces. By opening with ‘Self-Portrait’ for example (a very atmospheric rendition of reverbed piano, led by a single choral voice), it is setting up the following to contrast the dark, foreboding atmosphere created by the lead piece. By building the tension, then releasing it so adeptly, it makes the following sections all the more pronounced. Another aspect of this album that was missing from previous outings is the usage of field-recordings and samples. Aside from the aforementioned choral voice, there seem to be a lot more uses of (barely noticeable) background noise that adds depth to the mix, making all these pieces sound a lot fuller, and adding emphasis to the inherent emotion. “White Paper” is an excellent example of this. What would usually be a fairly standard piano riff is founded first of all by an atmospheric drone, created with the use of delays, and reverbs, giving the impression of a digital wave, once again utilizing the technique to clear space for the piano part that is to come. When the piano does eventually enter on top of it’s foundation, there is still some digital effects occurring, giving a usually beautiful instrument a harsher edge. When the end of the piece comes, it seems as though the piano was just a fleeting insight into something that lay below the effects… like we saw through a window that was created especially for us. It is this sense of discovery that really makes the listener feel like they are a part of the music. As you move through the album, you never get the impression that you are moving towards clarity, even in beautiful unaffected pieces like ‘Drops’, there is a certain off note, changing the whole key of the piece from decidedly upbeat to something a little more apprehensive. It is amazing how Anoice constantly defy expectations, adding something more each time around, to confound the listener. My only criticism would be that, whilst this collection is indeed wholly cohesive, the very fact that they work so hard at shifting expectations, it is sometimes hard to maintain momentum from one half of the album to the other. I think that, had they repeated themes a little more (the choral voice from “White Paper” for example, being found in penultimate track, “Finale” is a good example of how to keep with a theme) the collection as whole would have felt a little more sequential. If you're looking for a pleasant diversion, look elsewhere -- this album was written by the Japanese quintet Anoice in the wake of the catastrophic earthquake, tsunami, and nuclear accident that devastated parts of coastal Japan in March of 2011. Presented as "both a reflection on disaster and a prayer for healing," Black Rain is quiet but intense, and while it is remarkably beautiful it's also poignant to the point of heartbreak. This group plays mostly acoustic instruments (piano, cello, viola, percussion, guitar) but also incorporates synthesizers and what sound like occasional samples into its compositions. At times those compositions are deceptively simple-sounding, and sometimes (as on the quiet and lovely "Ripple") they are genuinely simple. But they effectively convey a sense of both loss and hope, of contemplation and occasionally anger. The first eight tracks on the program build up to the appropriately titled ninth track, "Finale," which is sonically big without quite lapsing into bombast, and emotionally powerful without lapsing into bathos. The album then ends with "Fall Asleep," a piece of nearly subliminal quietness and gentle beauty. Crisis often produces art, but not very often does it result in art this engaging. For those unfamiliar with Anoice, they are a five-piece ensemble from Tokyo, whose members include Takahiro Kido and Yuki Murata, whom you may already be familiar with, not only as solo musicians, but collectively in other projects such as RiLF and mokyow. Kido is also the owner of the Ricco Label of which this latest offering by Anoice is released. 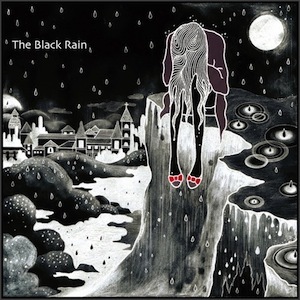 'The Black Rain' is the fourth album by Anoice and for me, their strongest yet. The general theme seems to be something that starts rather fragile, yet broods into something a lot more sinister. Speaking to Kido, he told me that the events of last year in Japan had played a major influence in the direction of the mood of the album. Listening to it, this ambience and orchestration plays a much more significant role in not only the structures of the songs, but the album as a complete piece. Placing them into a genre would not be an injustice as such, but simply too misleading. In the same way, comparing them to artists of a similar vein proves just as difficult. In various tracks, I hear Steve Reich as much as I hear Godspeed You Black Emperor, or Deaf Center in others. Yet this still feels like I am leaving many stones unturned in what lies behind Anoice's style. It has been commented on that the interludes detract from the main pieces. While to some extent I do agree that it can sometimes feel that they interrupt the transitions from one song to the next, I don't feel that it is enough to detract from the merit of the album. Comparing it with previous efforts, you really become aware of how already accomplished musicians and writers have flourished into something that will certainly impress current listeners, as well as gain a new audience. They've shown their full potential in 'The Black Rain' and I cannot recommend this album highly enough.